Gleaming silos, towering container cranes and hulking cargo ships docked at quaysides in Europe’s biggest corn and sunflower producer should be a symbol of an agricultural exporting powerhouse. Instead, it’s a cautionary tale of how Ukraine may squander another opportunity to plug the former Soviet republic into the global economy and give safe harbor to the world’s biggest investors. It’s not just Ukraine’s increasingly forgotten four-year civil conflict that’s an issue here along the Black Sea. It’s also about whether authorities are committed to modernizing a nation that sits astride Russia and the European Union. The risk is that it falls back to the cronyism and corruption that has plagued the country even after two post-communist uprisings. The government is moving ahead with a plan to complete the privatization of its maritime cargo handling system, which now handles 66 percent of all goods exported. While the land underlying 13 separate ports will remain state-owned, the government is pushing a to hand over the final 25 percent of cargo handling to professional stevedores -- or, local handlers fear, the nation’s well-connected businessmen. The running of the ports is “worse than an old Soviet pig farm,” said Oleksiy Vadaturskyy, the owner of Nibulon Ltd., a central Ukrainian farming company that handles its own grains for export in the port city of Mykolayiv. No one doubts the present system, held together by a maze of obtuse leases and other arrangements developed since Ukraine’s independence in 1991, needs to be streamlined. The aim is to bring in investment to the ports over the next two decades. A new law on port concessions passed the first reading in Parliament and the country’s infrastructure minister said on Wednesday he hopes the second reading will take place in October. President Petro Poroshenko urged lawmakers to finalize the law before the 2019 elections. But while the government claims it wants to attract international investors, there’s a lot of baggage. Ukraine ranks 130th in Transparency International’s latest Corruption Perceptions Index, the lowest in Europe except for Russia and at a par with Myanmar and Sierra Leone. Then there’s geography: Russia’s takeover of the Crimea peninsula has hampered flows in and out of the Ukrainian port of Mariupol 110 kilometers (68 miles) south of the embattled city of Donetsk. “Whoever wants to invest in these ports, they are going to have to really think about it significantly because there is quite a big risk attached to it,” said Amanda Paul, a senior policy analyst at the European Policy Centre. The 13 ports in Ukraine, a nation of 44 million people, handled a combined 133 million tons of cargo last year, falling since 2014 because of a drop in business with Russia. It’s less than a third of the cargo handled by Rotterdam, the busiest port in Europe. 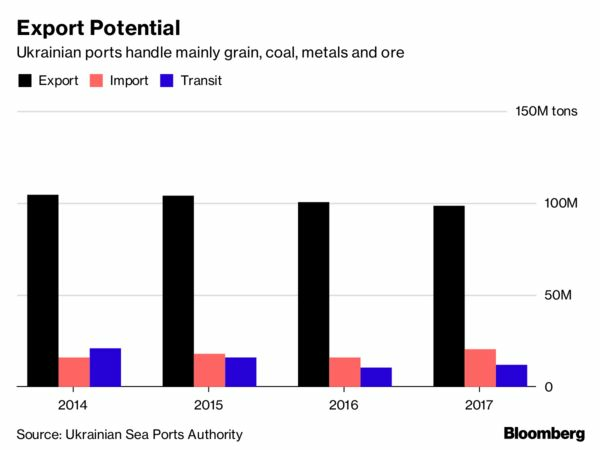 The Ukrainian Sea Ports Authority will invest at least 15 billion hryvnia ($528 million) by 2023 to strengthen quays, dredge ports and transport links as an incentive, said Raivis Veckagans, its chief executive officer. The first ports targeted for sale will be Olvia and Kherson, with Yuznyi and Chornomorsk coming later. The state will look for commitments totaling a combined $200 million, he said. On Wednesday, potential investors gathered in Kiev to discuss the first concession projects. The Infrastructure Ministry said on its website that among those attending were representatives of System Capital Management, the holding company for billionaire Rinat Akhmetov’s steel interests, Nibulon, Mitsubishi Corp., China Harbour Engineering Company Ltd. and companies from Turkey, Qatar and Korea. Even so, some existing stevedores are concerned the law may force them to give up operations to newer, larger bidders or sign new agreements under unfavorable conditions. The few companies that have opted out of dealing with the state entirely, such as Nibulon, are afraid they may be pressured to take part in the restructuring. On a recent day in Yuzhnyi, the largest and deepest dry cargo handling port in Ukraine, containers the size of trucks were being hauled onto ships by TIS Group, a Ukrainian handler. CEO Andriy Stavnitser, whose father founded the firm as the Soviet Union dissolved, is optimistic, provided the concession process is managed fairly. “Think about it as the Wild West,” said Stavnitser. “And this is going to be a more civilized environment. It will happen in any case. The government can never be fully efficient, full stop.” Still, this is Ukraine, he said. Indeed, some of Ukraine’s richest men are keen to get a piece of it. Akhmetov’s SCM is “prepared to help the state to modernize and develop” the port system after the law is passed later this year. “As long as the state offers transparent and adequate conditions,” it said in a response to Bloomberg questions. A hazy line between what is private and state property reflects decades of changes in the government’s approach to ownership rights. Farming group Nibulon spent $2 billion to buy a chunk of harborside property next to the state facility, creating a complex of silver silos and elevated pipes and a ship-building facility. But Vadaturskyy was once summoned to Kiev to meet with a government official, who proposed folding Nibulon’s private facilities into the adjacent state-owned Mykolayiv port.